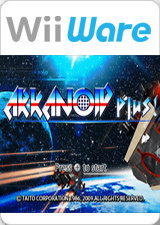 A WiiWare version of Arkanoid, titled Arkanoid Plus!, was released in Japan on May 26, 2009, in EU regions on August 21, 2009 and in North America on September 28, 2009. The boss' animations are stuck and is impossible to defeat because the ball goes right through him, this is fixed by disabling EFB Copies to Texture Only. The graph below charts the compatibility with Arkanoid Plus! since Dolphin's 2.0 release, listing revisions only where a compatibility change occurred. This page was last edited on 18 December 2017, at 04:54.